Prior to testing, we based my training paces on race paces from my first full marathon on April 24 (3:34:54, an 8:11 avg.) and my last half marathon on March 20 (1:34:30, a PR). The reason we used a combination of the times from these two races, and not just my marathon, is because my half marathon went extremely well, but my full marathon didn't go as well as planned. I didn't come close to hitting either of my time goals (a 7:50 or 8:00 avg.). I was very anxious, I went out way too fast for the first 10 miles (7:36 avg. ), and my legs felt dead from the start. None of those issues indicate that my fitness wasn't where it should have been for the marathon, but you still can't ignore the final results. However, in the weeks leading up to testing at the HPC, I was having a lot of tough runs. Quite a few yellow and red runs, especially on speed days (I color code my workouts. Green = great, Yellow = average, Red = bad). We partially attributed this to anemia and heat/humidity acclimatization, which were factors. 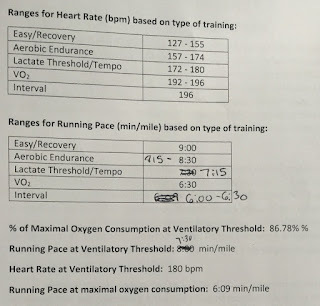 However, after going through testing at the HPC, we also realized that my workout paces determined from my recent races didn't correlate with my current fitness and the workout paces Eric suggested based on my test results. They were all too fast. So, Coach Amanda immediately started assigning the new paces to my workouts. Results! June 30 & July 2, 2016: An aerobic run and a long run using new paces. A key for me was to use the Activity Alert function on my Garmin 225. I set the slow and fast alerts to a :15 pace range. I'd never done this before. I think the reason it worked is because, normally, I run too fast. I look down at my watch, see that I'm going to fast, and slow down a little. However, I worry that, in trying to slow down, I'll slow down too much, so I speed back up. For whatever reason, the watch alerts stopped me from doing that. It beeped/buzzed at me, and I slowed down. Eventually I stopped speeding up and it stopped beeping. And the paces were right, because I had two awesome runs! I felt great, didn't have to stop, legs didn't feel dead, and I could have kept running! Week of July 11, 2016: Another green week! All runs at paces suggested by Eric, based on HPC data. Again, hard runs were hard like they should be, but not impossible. Two totally green weeks in a row is incredible! My only worry is whether I'm pushing myself hard enough, but I feel like I'm training where I should be and like everything is in control. November 25, 2016: I went back to the HPC on November 4 for a retest. I skipped the Bod Pod and just did the VO2max and lactate threshold treadmill test. 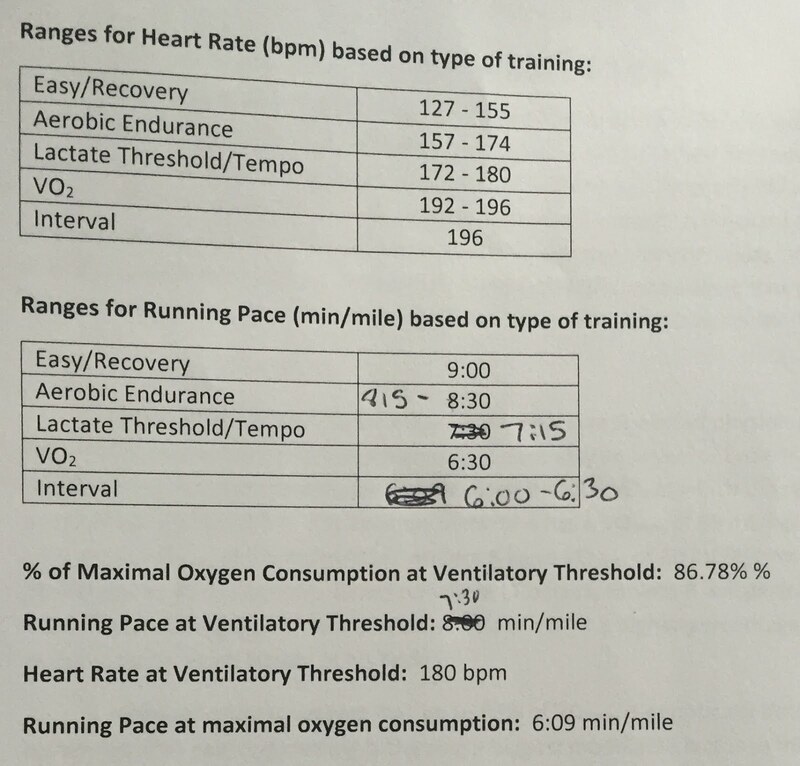 Results showed that my VO2max has increased around 5 points from 44.37 to 50.4! I retested three weeks after the Detroit Free Press Marathon, when I was at peak fitness. This means my VO2max may have been even higher had I retested the week before the marathon. However, my training heart rate ranges and paces haven't changed because (need to talk to Eric about this again). I spoke with Eric Jehnsen after the testing to get his take on my retest. I was their first HPC follow-up! Me: "Would you say my retest was what you would have expected?" Eric: "I would say you were 3-4 weeks post-marathon? You were a little detrained and still went up almost 10%. Dr. Keteyian said if we tested you a week after the marathon or the day before the marathon you might have been 17-18% (or whatever it might have been) higher. So, all in all, yes I think so. Your fitness level clearly improved. If we caught you at the peak, right before the race, it would have been even higher." Even though I don't have new training paces, I'm still extremely happy I went back to the HPC. The Detroit Free Press Marathon wasn't a great race for me. I ran almost 13 minutes slower than my April marathon. I know the warm weather and high humidity didn't help, and I didn't fuel properly. It was great to see that my fitness did improve with all of my hard training! It also gave me confidence going into my shorter fall races. On November 12, a week after a tough trail half marathon, I ran a 5k that was 2 seconds off of my 5k PR. This was also while I was back in base training. On November 24, I ran a 16 second 10k PR! So, not only do I know that my fitness did improve, but the HPC results confirm that my fitness and training were not the causes of my slower fall marathon. Coach Amanda and I know we're on the right track by addressing fueling. Nothing we can do about the weather. We're also going to add in more VO2 paced speed workouts this fall.